Since 1988, Rotary has been in partnership with the World Health Organisation (WHO), the US Centres for Disease Control and Prevention, and UNICEF – along with other humanitarian organisations and national governments - to achieve this lofty goal. It will be only the second time in history that a major disease has been eradicated from the world’s population – smallpox being the first. A 99 percent reduction in the number of polio cases worldwide has been achieved. Rotarians stand at the brink of a great victory and look forward to celebrating the global eradication of polio. In the early 1980s, several Rotary leaders proposed beginning an organization-wide project separate from local efforts. At the suggestion of Albert Sabin, inventor of the oral polio vaccine, Rotary chose as its goal universal immunization of children against polio. It did not envisage eradicating polio. A two-year campaign brought in $247 million, not $120 million planned. Partly on the strength of that support, in 1988 WHO announced its intent to rid the world of polio. But eradication has proved more difficult than anyone anticipated. The target date was originally 2000. The extra time required more money and during 2005 Rotary completed a second fundraising campaign, which raised $111 million, the target was $80 million. The clubs' contributions, including interest, now total almost US$800 million. Thousands of Rotarians, both local and foreign volunteers, have participated in national immunisation days when vaccine is given to millions of children over a few days. Occasionally, club members play a role nobody else can. Angola has a single Rotary Club of 32 people who meet in the capital, Luanda. They are led by Sylvia Nagy, who with her husband owns a foundry. In 1997, a 25-year civil war, which ended with the death of rebel leader Jonas Savimbi, was underway. There had not been a vaccination campaign in the rebel-held half of the country in years. Nagy, along with representatives of WHO and UNICEF, negotiated a truce so immunisation days could be held in June that year. About 2.5 million children were vaccinated. On 2 Sept 2003, Angola marked its second year without a single case of polio. 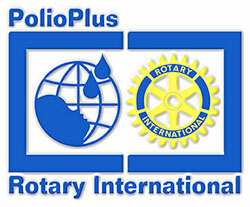 PolioPlus Partners is a program that allows Rotarians to participate in the polio eradication effort by contributing to specific social mobilisation and surveillance activities in polio-endemic countries. As of 30 June 2005, clubs in 462 districts have participated in 430 PolioPlus Partners projects, supporting National Immunisation Days and other polio eradication activities around the world. Rotarians from this District have participated and are encouraged to do so again. Dr Margaret Chan, CEO of WHO went public in June 2008 to express her admiration and support for the Rotary International organisation and its 1.2 million members who to date have raised more than US$1.3bn and contributed countless volunteer hours to protect more than two billion children in 122 countries from the threat of polio, spare five million from disability, and avert more than a million deaths. She pledged the entire resources of WHO to assist Rotary and other partners to complete the historic mission. When Rotary launched its Polio eradication program, there were more than 350,000 severe cases of the disease worldwide each year. In the year ended 31 December, 2011, there were fewer than 160 cases contained in just three countries. India was declared polio-free in February 2012. Such has been the success of the campaign that the Bill & Melinda Gates Foundation has also thrown its considerable resources behind the program, recently awarding Rotary two challenge grants totalling US$355 million, which Rotary has matched with an additional US$200 million, with all of the resulting US$555 million earmarked for polio eradication. Rotary has also played a major role in convincing donor governments to contribute over US$4 billion to the effort.